From file encryption and ransomware protection to a hardened browser to a game mode to just about everything you could want, Bitdefender Internet Security 2019 has some of the most intricate defense systems in this industry. It comes with superb malware protection and lightweight system impact, while its newly upgraded Autopilot helps you navigate your computer’s security by providing useful advice. Let’s go through this brief review and understand some of the best features of this tool. Bitdefender retains its beginner-friendly “Autopilot” feature and has upgraded it with new capabilities. It detects and blocks the threats without any user intervention. Earlier, it used to delete the suspicious files without informing the user. But now, it will prompt users for recommendations. The VPN is now bundled into the suite which is a positive addition. But you will stay limited to 200 MB of data transfer per day. In order to utilize unlimited bandwidth, you need to pay £30 a year. The downside is that you are not allowed to choose your exit node here. Don’t miss to check VPN for Android. 2019 version offers you real-time protection against all online threats including viruses, malware, ransomware and Trojans. Its built-in ransomware layer protects you by introducing multiple data protection layers using behavioral threat detection to safeguard your photos, videos, music and other documents from ransomware attack. The ‘Safe Files’ feature lets you select which directories you wish to protect. The ‘Advance Threat Defense’ feature allows you to keep a check on suspicious behavior of an application. It comes with its own firewall protecting you against the hackers. This feature ensures that the users stay protected from malicious websites and informs if a website is safe to browse or not. Also it will install its own extension on your browser like Chrome, Firefox or Edge to check the suspicious behavior of a site. These features will alert you if you land on a phishing website. The people using social networking websites can stay protected against malicious links using Social Network Protection feature. The Safe Online Banking Feature has been improved allowing users to shop and bank from a unique dedicated browser securing their transactions preventing frauds. Your credit card details are filled automatically in the billing fields with Safepay. Webcam Protection feature protects your privacy and prevents any webcam links by notifying when an application is trying to access the webcam. It creates an encrypted password protected vault on your computer to store confidential documents. The vault can be created easily. You can protect it with a password, which will encrypt and protect all your files. It is a handy feature for users who share devices with other people at home or at their workplace. This feature allows you to delete a file for good without leaving traces that it ever existed on your computer. It comes with its own password manager securing your credit card information and other sensitive data in a cyber-vault for easy access. It even recommends strong passwords and all your online forms are filled in automatically. It scans for potential security holes with just a single click and checks if your computer is outdated or any vulnerable software has been installed, missing Window Security patches, and potentially unsafe settings suggesting the best solution. The Wi-Fi Security advisor accesses the security of your Wi-Fi network and router and tells you about any vulnerability. Parents can keep an eye on their children’s online activities using parental control feature. They can easily filter out inappropriate content like sketchy websites, limiting screentime every day. They can remotely get connected to Bitdefender Central and keep up with the activities of their kids. AV-Comparatives rated it very fast for nearly each and every test. Though browsing was not up to the mark recording a 25% slowdown, other test results were awesome. Bitdefender romped through all the AV-Comparatives and AV-Malware tests scoring 100% across the board, against both known and zero-day threats. 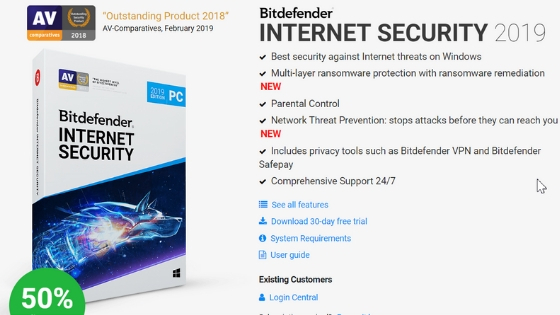 Bitdefender Internet Security 2019 is the upgraded version of what it was in 2018. It is one of the best internet security suites available. It is a bit different from the previous year iteration and comes with some improved features. There is no doubt that we recommend this internet security suite.